There are some situations, proposes Christian Klemm, deputy director at the Kunsthaus Zürich and curator of the museum’s new cabinet exhibition, Alberto Giacometti – The Art of Seeing, in which this type of examination is exactly what is required when it comes to gaining further insight into the work of great artists. The new show comprises around 60 pieces drawn from the collection of the Alberto Giacometti Foundation, the most important collection of works by the Swiss artist in any museum. In the foundation’s collection are around 400 sculptures, paintings and drawings, although only 15 to 20 percent of these works are on display at the Kunsthaus at any one time. Many works in the collection were donated by Giacometti himself, or by members of his family. Dr Klemm, who is also the foundation’s curator, presents cabinet exhibitions such as The Art of Seeing every year or so to enable greater public access to the collection and further understanding of Giacometti’s work. At the heart of this show is the idea that Giacometti’s artistic practice was bound up with the act of seeing and its role in our perceptions of reality. Dr Klemm calls this “one of the main axes of [the artist’s] thinking” and points to specific examples in Giacometti’s work that show this process in action, whether that be the direction of a subject’s gaze or the choice of presenting an image front-on or in profile. Alberto Giacometti was born in Borgonovo, Switzerland in 1901, studied in Geneva and Paris and then set up his first studio in the French capital in 1925. 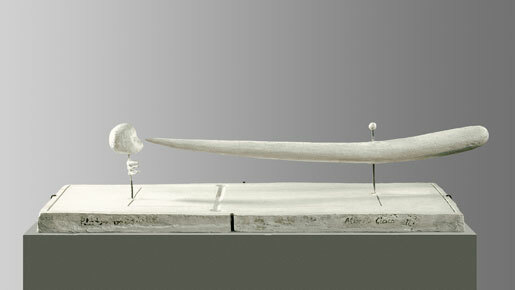 His work drew the attention of the surrealist movement, and for the next decade Giacometti exhibited alongside other members of the group, associating with artists such as Max Ernst and Joan Miró. The sculptures and drawings he produced during this period are concerned with symbolism, abstraction and psychology and are heavily influenced by primitive sculpture. It was only after the war, and following a long period of experimentation, that Giacometti’s focus became the style of work that now defines his oeuvre in the modern mind. The slender, elongated and often eerie figures that characterise his mature work appear to be carved directly out of the bronze from which they are cast. The Art of Seeing includes pieces from every period of Giacometti’s prolific career, but focuses on those works that are directly concerned with perception. The 1928 ‘plaque sculpture’, ‘Gazing Head’, presents an image that is simultaneously abstract and human, a face that both gazes at the viewer and away into the far distance. ‘Point to the Eye’ (above) shows a blade threatening to pierce the form of a human head directly in its eye socket, yet prevented from doing so. Both pieces evoke questions concerning the relationship between artist and subject and the status of seeing as an affirmation of being, issues that fascinated Giacometti and informed his work in myriad ways. There is much to be gained by such an approach to Giacometti’s work, but it’s worth bearing in mind that consideration of these complex issues is just one route into the oeuvre of one of the 20th-century’s greatest, and most accessible, artists. Dr Klemm is keen to stress that when it comes to these sculptures and paintings, “you can look at Giacometti as you like, so you get also a kind of overview of his work without trying to understand too much”. When it comes to discovering the truth behind the ‘art of seeing’, it’s a matter of coming to see for yourself.